On the basis of the national reports (see questionnaire) and the integrated versions available in EFL Volumes 2 and 3, the Commission on European Family Law is able to present its first and second set of Principles of European Family Law. To order this book click here. The principles are available in this book in English, French, German, Dutch, and Spanish. These language versions are all authentic and have been approved by the Organising Committee. However, it must be noted that these principles cannot be read alone and must be read in conjunction with the Comments and Comparative Overview provided in the publication. An unofficial translated version of the principles in Hungarian, Italian and Polish is also available. 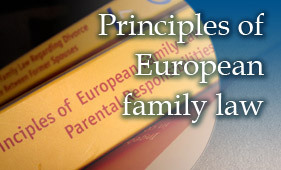 On the basis of the national reports (see questionnaire) and the integrated versions available in EFL Volume 9, the Commission on European Family Law is able to present its third set of Principles of European Family Law. The principles are available in this book in English, French, German, Dutch, Swedish and Spanish. These language versions are all authentic and have been approved by the Organising Committee. However, it must be noted that these principles cannot be read alone and must be read in conjunction with the Comments and Comparative Overview provided in the publication. An unofficial translated version of the principles in Hungarian and Polish is also available. On the basis of the national reports (see questionnaire) and the integrated versions available in EFL Volume 24, the Commission on European Family Law is able to present its fourth set of Principles of European Family Law.